Have you ever forwarded a message (for example to a Gmail account) in Mozilla Thunderbird, and gotten one of these pesky message? a potentially executable attachment "Hey Buddy.eml"
I have. This error baffled me because I never had problems forwarding messages before and just wrote it off as a “quirk” in Thunderbird. However, after doing some research (and carefully reading the error message), I found out that Thunderbird is forwarding the email thread as an .eml attachment. 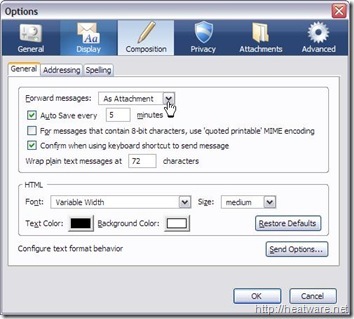 Next to the Forward Messages option, click on the drop-down box and choose the option Inline. Click OK.
Now try forwarding a message… This one won’t bounce back! I have been trying to work out a way to get my sweetheart back again for a couple of days. He definitely is a very good gentleman and he has never ever done anything to purposely distress me, but the very last time we discussed pertaining to some really little private complications we have both been undergoing just came to a head and before we both knew it we happen to be each claiming things neither of us meant.